Go All Out For Your Valentine! 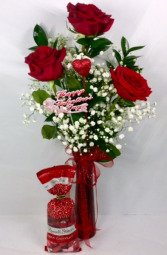 Choose 12, 18, or 24 premium long stem red roses in a clear glass vase with babies breath. It is accented with a flashy, large red bow and a "Happy Valentine's Day" pick. This arrangement also includes a box of DeBrand Fine Chocolates 12 pc. Truffle Collection, and a huge 33" tall soft and cuddly teddy bear. 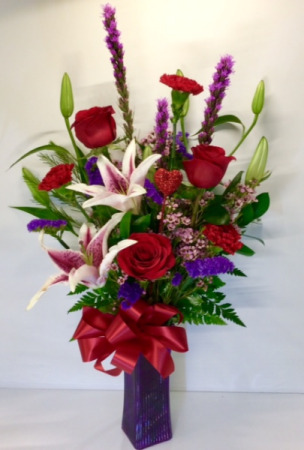 This is the perfect arrangement to show your romantic side! It is a ruby red glass cube filled with fresh premium roses encircled by seeded eucalyptus for just the right texture. A glittery decorative ribbon is wrapped around it to finish it off.